The Harley-Davidson Ultra Limited is almost as large as an SUV. It also costs as much as an SUV. This is a seriously large motorcycle. You would think there’s plenty of good places to mount a phone or GPS but surprisingly not. We have the usual photo with this article that shows the Harley-Davidson Ultra Limited cockpit. It’s a busy cockpit. We’re going to concentrate on a few locations for consideration when mounting a smartphone or GPS. The Harley-Davidson Ultra Limited handlebar is a standard diameter. That’s good. It means most motorcycle handlebar mounts should fit fine. Except for one thing. It slopes downwards toward the stem. This means you need a a mount that integrates an extended arm. Also, be sure that a mount made for a motorcycle is used. Avoid bicycle mounts as the diameter is likely going to be too small. The handlebar control is another good place for mounting. Given the unusual shape of the handlebar, this might be the preferable location. Most mounts made for this location include replacement bolts to extend long enough to accommodate the added depth of the mounting attachment. These aren’t difficult to install if you follow the manufacturer instructions. However, if you feel uncomfortable doing it, your motorcycle mechanic is likely to be happy to do it for a nominal fee. We see more people using phones on a motorcycle these days versus a dedicated GPS so let’s start with the phone mounts. Waze is a terrific GPS app. There are also some nice motorcycle GPS apps such as the Navigon Cruiser. We always recommend using a good case like an Otterbox Defender or LifeProof to protect your phone against road debris. It will help to protect against potential damage to your expensive phone and it’s worth the small investment. It looks like the handlebar control attachment might be the way to go on the Harley-Davidson Ultra Limited. Consider the RAM Brake/Clutch Reservoir Mount with Universal X-Grip IV Phone Cradle. These come with a set of bolts that will replace the factory bolts that came with your Harley-Davidson Street Glide. They are a little longer than the original bolts to accommodate the added length of the mounting post. These mounts feature the expandable X-Grip IV cradle which can open to 4.5 inches which is large enough for almost any phone. As we alluded to earlier, these are more difficult to install than your basic handlebar mount so be sure to follow the directions and use a mechanic if not comfortable working on your motorcycle. A similar mount which will fit the handlebar on a Harley-Davidson Ultra Limited is RAM X-Grip IV Handlebar Mount. These are heavy duty mounts that are mostly constructed of metal. The mount has gone through some rigorous shake tests and holds up well on a motorcycle. This mount has the same cradle as the handlebar model opening to 4.5 inches. These mounts attach to your handlebar and allows complete 360 degree rotation of your phone. The mount includes a three-inch arm which gives added life necessary for the Harley-Davidson Ultra Limited. Both of these mounts include a lifetime warranty from RAM. The manufacturer now includes a safety tether with these mounts which we strongly advise using for added safety. For a dedicated GPS, the above phone mounts will fit many car GPS models such as a Garmin Nuvi or Drive. They need to be 4.5 inches tall or less. For a motorcycle GPS such as the Garmin Zumo 595LM, consider using the mount that is included in the box. That’s a solid mount that will fit the handlebar controls or around the handlebar itself. Mounting an action camera may prove difficult. The problem is going to be to find a mount that reaches high enough to clear the dash and windshield. 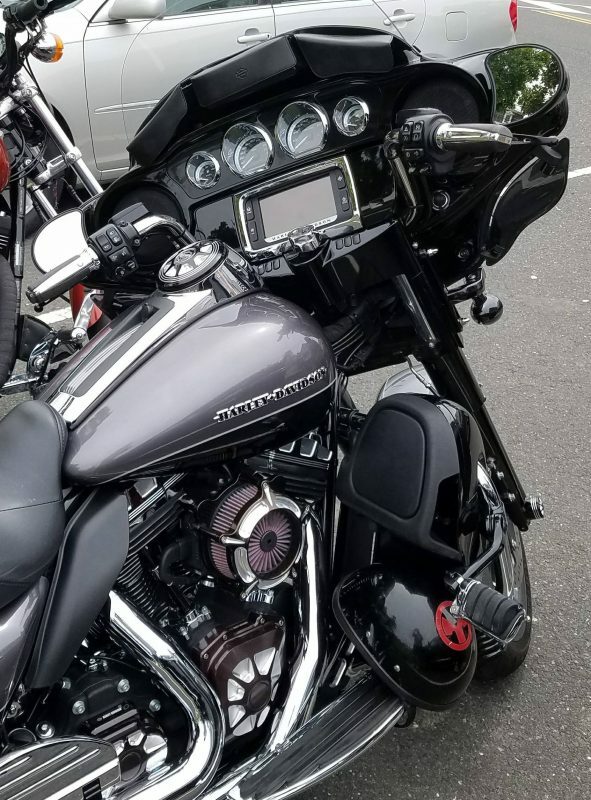 We aren’t going to recommend a camera mount because of the added height necessary on the Harley-Davidson Ultra Limited.